Ph.D. in Physiotherapy is a 3- year pre-doctorate degree program, the minimum eligibility is master degree in Physiotherapy from a recognized college or university or its equivalent exam. For admission to Ph.D. in Physiotherapy depends upon commencing of applicant's performance in a relevant entrance exam, and resulting round of counseling. 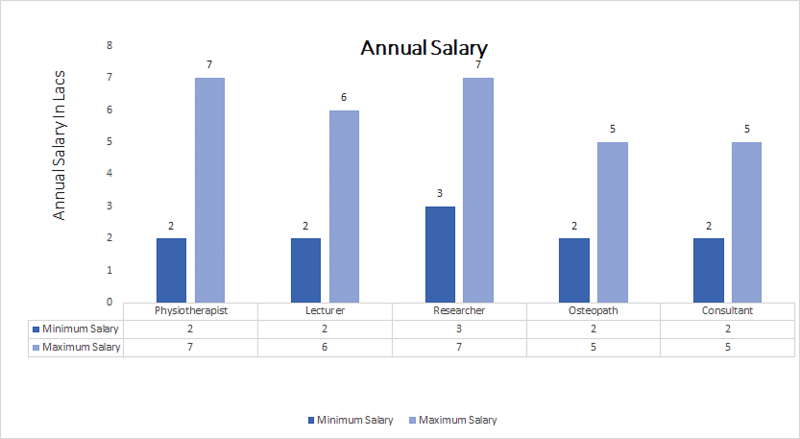 The average tuition fee charged for Ph.D. in Physiotherapy program in India ranges between INR 1,000 to 2 lacs, for a span of 3 years. Ph.D. in Physiotherapy, one of the branches of Medicine & Health, is an interdisciplinary subject, where candidates, both Bachelor’s and Master’s graduates, learn how to help people with physical impairments. Candidates will have to be familiar with notions of Psychology so as to help peoples to overcome their insecurities and encourage patients into facing their fears and get better. It provides an opportunity to analyze human motion in a variety of activities utilizing clinical and research instrumentation. It enhances framing of research designs to draw conclusions. It encourages the managerial skills necessary to continue the advancement of the physiotherapy research. With a Ph.D. in Physiotherapy course, candidates can develop a leadership role in physical therapy profile. Candidates can also join research groups to grow new treatments and teach at a university or college level. Candidates can work as a private physiotherapist, take on a not-for-profit position or work in the public sector. Such postgraduates are hired in capacities such as Osteopath Lecturer Researcher Therapy Manager Research Assistant Customer Care Assistant Assistant Physiotherapist Sports Physio Rehabilitator Self Employed Private Physiotherapist etc.The average salary of the applicants in this field is INR 5,50,000. Top Job Areas Government or Private Hospital, Medical Colleges & Universities, Private Clinics, Medical & Research Labs, Content Writing (medical) etc. Ph.D. in Physiotherapy: What is it all about? Ph.D. in Physiotherapy focuses on the science behind physical rehabilitation. Candidates in this course attend lectures, seminars, conferences, and classes that concentrate on the evidence-based process of physiotherapy. The course prepares candidates for an extensive range of fields, they also do research and write papers to display their own discoveries regarding physiotherapy. At the end of the course, a candidate will usually be able to diagnose and treat physical impairments and educate future physiotherapists, patients or their families. Physiotherapy is a branch of healthcare that applies modes of physical movement such as exercise, massage, besides education, advice, and counseling services to circumstances where movement and function are threatened by aging, pain, injury, diseases, disorders, conditions, or other environmental factors. Taking this course is beneficial because candidates gain an intimate knowledge of exercises, motivation techniques, education methods, advocacy tools and equipment uses. A Ph.D. degree in Physiotherapy program can relate to geriatrics, sports medicine, pediatrics, cardiopulmonary, orthopedics, and different other areas of medicine. Ph.D. in Physiotherapy​ course aims to empower and encourage engagement in physiotherapy research broadly. The system tries to energize development in the numbers of researchers associated with physiotherapy research, and enhance the amount of research produced – and its implementation and integration into practice. All suitable resources and services access needed to support this research is accessible from the School of Health and Rehabilitation and collaborating organizations. Post Graduate degree in relevant subject or equivalent with at least 50% marks in aggregate. Applicant should clear the common entrance exam conducted by the University for the Course. In India, universities have rights to set their own procedure and standards for the Ph.D. programme admissions. But the set of requirements for the application are similar. This is referred to as NET (National Eligibility Test) and is administered by the University Grants Commission (UGC) for most subjects, with the exception of Science and Engineering which are covered by CSIR (Council of Scientific and Industrial Research). Physiotherapy is one of the recognized professional careers and is among the top career choices made by candidates in India. Talented professionals in this field are rising day by day, which has lead to the creation of lots of employment opportunities for talented physiotherapist. Graduates can seek employment in centers that help physically challenged people, orthopedic departments, private & government sectors, health institutions, rehabilitation centers and in defense medical organizations. Graduate professionals with some experience can also start his/her own private clinic. This helps them to gain more confidence as well as revenue. Skilled professionals in this field can also find employment in universities, fitness centers, nursing homes, schools, sports clubs, hospitals, offices and in colleges. There are lots of job opportunities available in India as well as in foreign countries for physiotherapists.